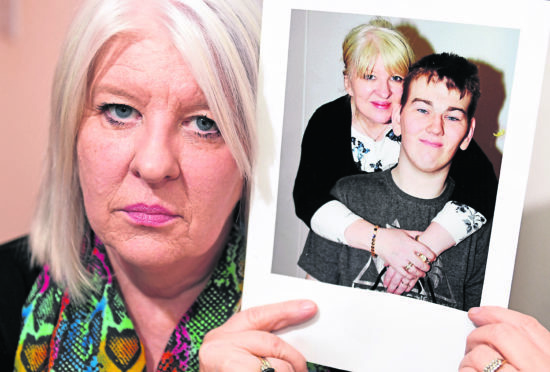 A north-east mum has launched a crowdfunder to battle for her son to be released from Scotland’s state psychiatric hospital. Kyle Gibbon, who has ADHD, has been in Carstairs almost continuously since he was 18 despite having no criminal conviction when he went in. He had been a patient at Royal Cornhill in Aberdeen and was due to be allowed to leave to supported accommodation, but following concerns over his care he was sectioned and transferred to the South Lanarkshire facility – 13 years ago. Mr Gibbon is now 31 and his mum, Tracey has previously said that the experience has “institutionalised” and “crushed” her son. In order to get his case reviewed, she will have to pay for an independent review which costs £3,000. Now Ms Gibbon, of Kemnay, has launched a crowdfunding campaign to help raise enough cash to pay for the review, which has so far reached about £250. In a post on the Go Fund Me website, she states: “Kyle should be allowed to return home and receive the person-centred, appropriate care he has so far been denied. I would appreciate any support which would allow me to make a successful appeal for my son. “I would like to celebrate Christmas as a family next year, with some restoration of normality to our lives, something we have both been deprived of for the 13 years Kyle has been subject to institutions. It was recently revealed that more than half of under-18s sectioned under mental health legislation in Scotland have a form of autism. The Gibbons’ MSP Alexander Burnett has backed their campaign to have Kyle released and is now urging people to support the fundraiser through a video on his Facebook page. In his video message, the Aberdeenshire West representative said: “Tracey need £3,000 in order to finance the appeal process, so as she can hopefully enjoy Christmas with her son at home next year – 13 Christmases without Kyle is 13 Christmases too many. The Scottish Prison Service does not comment on individual cases.